Posted on July 27, 2017 by thelostlighthouse	in Comics, Literature and tagged Black Mask, Black Mask Studios, comics, comics reviews, Dee Cuniffe, detective story, Eric Zawadzki, Literature, Lonnie Madler, noir, Philip Marlowe, Raymond Chandler, The Dregs, The Long Goodbye, TLL, Zac Thompson. I’ve been meaning to get round to reviewing The Dregs for a while, and with all four issues being collected soon (August 9th), it seemed like the perfect time to talk about it. 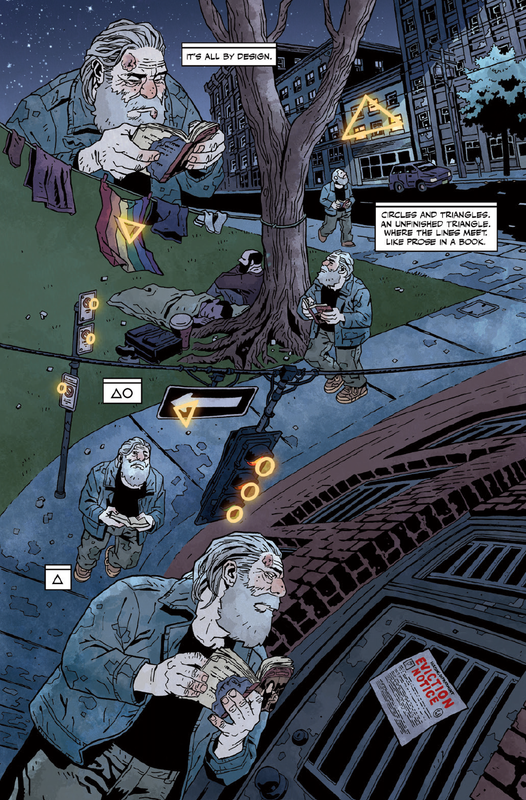 The Dregs was created by Zac Thompson, Lonnie Nadler and Eric Zawadzki and published by Black Mask Studios, with Thompson and Madler on writing duties, pencils, inks, letters and covers by Zawadzki, and colours by Dee Cuniffe. 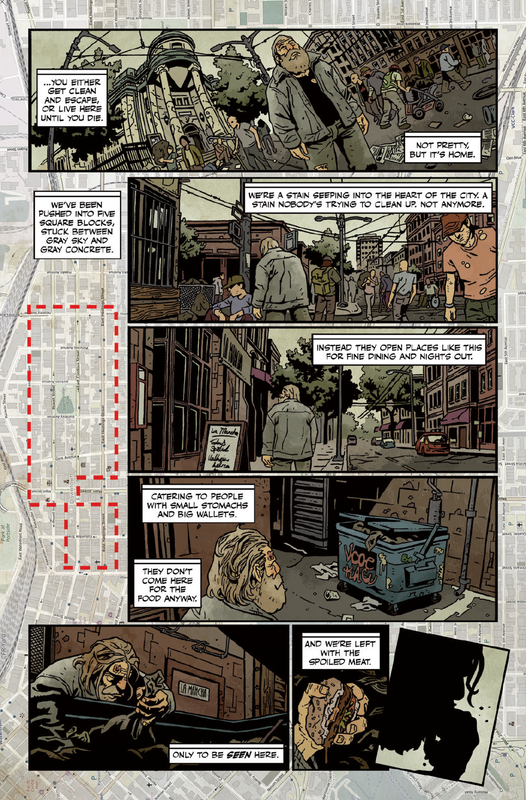 The Dregs is a grim detective story about gentrification, cannibalism and the human condition. Arnold is one of the many forgotten homeless on the streets of Vancouver, drug addicted and destitute and slowly being boxed into a five square block area known as The Dregs, as neighborhoods get homogenised and sterilised. But when his friend Manny disappears, it sends Arnold on a noir-esque trip through the streets, complete with mystery, death and even a femme fatale as he tries to get to the bottom of why the homeless denizens of The Dregs are disappearing, and why no one seems to care. The Dregs relies heavy on detective stories, to the extent that the only possession Arnold owns is a battered copy of Raymond Chandler’s The Long Goodbye, which he stuffs full of clues during his investigation. He even uses the pseudonym Philip Marlowe, the lead character of Chandler’s detective stories and one of the most recognisable gumshoes in fiction, when confronting people. There is a danger of creating an eye-roll inducing referential slant to a story by name checking like this, but the The Dregs takes these influences and weaves them in such a way that truly understands the detective story and the character of Philip Marlowe that were it not for the time displacement, I could believe that this was Marlowe decades after his adventures where his mistakes have driven him to the gutter. The twisted nature of the plot in The Dregs is certainly very strong, but it is almost framing device for the more important things the book has to say. The first is that genuine Marlowe feeling, the drive to uncover the truth not only to his own detriment, but in spite of the fact that no one else cares. Not even the people he is ostensibly trying to help. The second is how this factors in to the core theme of gentrification, of the uncaring nature of supposed societal improvement wiping away a problem (in an inventive an horrible way here) rather than treating the causes and truly helping people. And everyone is complicit in it. There isn’t just one evil cackling villain, but scores of people either turning a blind eye because they are too disgusted to look, or actually benefiting from wiping problems like homelessness away like an eyesore rather than people who need help, and have been let down by society. In this, I think The Dregs manages to deftly hold a mirror up to the issues that are compounded by “solutions” like those proposed in the book (and the real life attempts at dealing with homelessness and drug abuse are often barely less ghastly that they are here). The book doesn’t just rely on social commentary and noir dialogue though; the art from Eric Zawadzki is powerful in its own right. There is an ugliness to everything and almost everyone that sells the grim nature of the story, and for most of the four issue run the art is very strong, strongly evoking the work of Chris Burnham when he was working on Batman. So as a baseline, the art is good. But there are moments where it truly shines to be something truly great. Early on as Arnold’s investigation moves forward, the art takes on the form of a twisted puzzle, that goes hand in hand with the detective story setting. And in the last issue, as things start to both coalesce and fall apart, Arnold’s journey through the city takes on an Escher-style mind-bending trip, not out of place on storyboards for Inception or Doctor Strange. Cuniffe’s colours make these pieces look even stronger, and while the general street scenes are rendered all the more realistic by their drab palette, the unfamiliar areas of the city to Arnold are awash with a colour that seems blinding by comparison. I wasn’t expecting it going in, but The Dregs is one of the most effective and affecting books I’ve read this year. The grim nature of the plot and the skilled handling of the subject matter, combined with a spot-on detective noir style and some gorgeous art, make this something well worth your time. Issues 1-4 of The Dregs are available online through Comixology (and physical copies may still be available in your local comic book shop), or you can wait and check out the collection when it comes out on August 9th.